Did you know that we offer training courses? 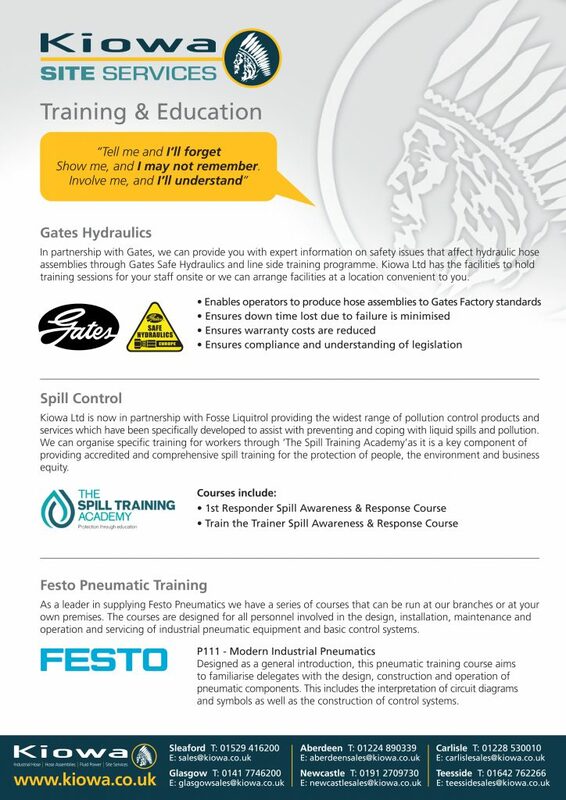 In partnership with Gates, we can provide you with expert information on safety issues that affect hydraulic hose assemblies through Gates Safe Hydraulics and line side training programme. Kiowa Ltd has the facilities to hold training sessions for your staff onsite or we can arrange facilities at a location convenient to you. Kiowa Ltd is now in partnership with Fosse Liquitrol providing the widest range of pollution control products and services which have been specifically developed to assist with preventing and coping with liquid spills and pollution. 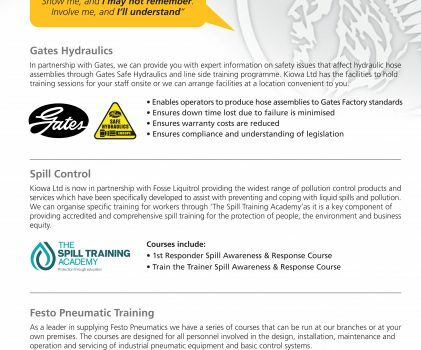 We can organise specific training for workers through ‘The Spill Training Academy’ as it is a key component of providing accredited and comprehensive spill training for the protection of people, the environment and business equity. As a leader in supplying Festo Pneumatics we have a series of courses that can be run at our branches or at your own premises. The courses are designed for all personnel involved in the design, installation, maintenance and operation and servicing of industrial pneumatic equipment and basic control systems. Contact any of our branches for more information.